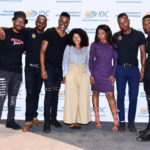 The IDC CEO Regional Roadshow stopped off for a packed full-day event in Brits, North West on 11 August, with the focus on partnerships with women, youth and black industrialists. IDC CEO Mvuleni Geoffrey Qhena was on the road engaging with stakeholders once more on the second stop of the IDC CEO Regional Roadshow, which took place at the Casa Grande Lodge in Brits, North West on Thursday, 11 August. The IDC CEO Regional Roadshow, in which Qhena visits various regions to engage with key stakeholders, kicked off in May and will run through until November. The objective is to increase awareness of the target sectors the IDC supports and the different kinds of support it offers. 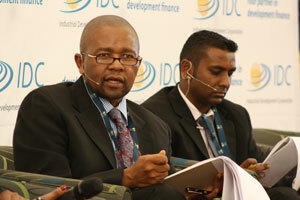 Through this, there is a drive to attract new clients with the focus on women, youth and black industrialists. The IDC opened its first office in the North West in 2008 and has since grown its exposure in the province from R1.4-billion to R6.2-billion creating more than 20 000 direct jobs in mining, agro-processing, metals and tourism. The latest roadshow event was a busy occasion featuring a keynote address by Qhena, a presentation by Regional Manager: North West, David McGluwa, testimonials from IDC clients, an exhibition as well as a question-and-answer session. “The IDC’s key partnerships with stakeholders such as commercial banks, business chambers and government within the North West has proven to be key in ensuring that the Corporation’s mandate to stimulate local economy and facilitate job creation is a success,” McGluwa said. IDC client Saffiyah Booth, a shareholder in Booth Suite Hotel, provided the first testimonial of the roadshow event, profiling the hotel company and the impact the IDC has had on it. Saffiyah Booth, along with sister Farzeen and brother Shaah, are partners in the development of the four-star Booth Hotel Suite in Mahikeng. Construction began in May 2013, and the hotel now boasts 26 self-catering executive suites. “What we tried to establish with this hotel is sort of a home away from home for people who are business individuals that are always on the go,” Saffiyah said. 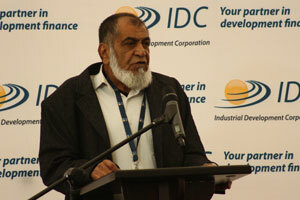 IDC client Mohamed Iqbal Tayob then spoke to the gathering about the company he heads up, Brits Bag Manufacturers, a family-owned operation which delivers a unique packaging offering in a highly competitive industry. Established in the 1970s with an initial investment of R5 000, Brits Bags Manufacturing uses polypropylene or plastic-based materials to service the agricultural, poultry and cement industries. Having supplied a large chunk of the agricultural market in South Africa, the company has now expanded into neighbouring Botswana, Angola and Mozambique. 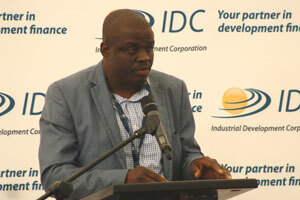 “The IDC’s support has given me the confidence to look at other sound ideas which could potentially create jobs,” Tyaob said. The final client testimonial came from Elias George, a Trustee at Momentous Foundation Community Trust. Through this Trust, set up and funded by the IDC, the communities of Lapologang and Maditlhokwa are 17% shareholders of RustMo1, a solar farm near Rustenburg. RustMo1 harnesses the power of the sun through 27 000 solar panels that track the sun’s movement through the course of each day, providing Eskom with a stable alternative source of electricity. With the help of the IDC and Nedbank, the solar farm was commissioned in 2013, becoming the first of its kind to connect to the national grid. “The presence of RustMo1, as well as the management company Momentous, extends beyond generating electricity, but also to making a difference to the surrounding communities,” George said. George explained that Momentous Foundation Community Trust was created to serve the interests of the community, among other things by monitoring dividends and assessing ways in which these could be used to improve the lives of those living in the surrounding areas. 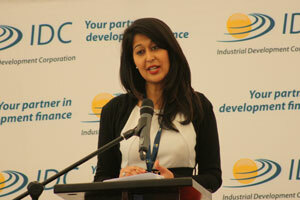 Speaking afterwards, IDC CEO Qhena described the event as a “well-attended, successful event. 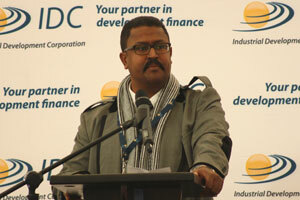 “This event stood out because of interest that the guests showed in the IDC,” Qhena said. “The constructive criticism we received was very useful and will allow us to reflect and improve in the region. 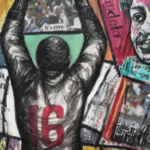 The IDC began establishing its regional footprint nine years ago, and now has 14 regional offices and 10 satellite offices across the country. The strategy has been hugely successful in furthering the Corporation’s mandate to drive industrial development and facilitate job creation.